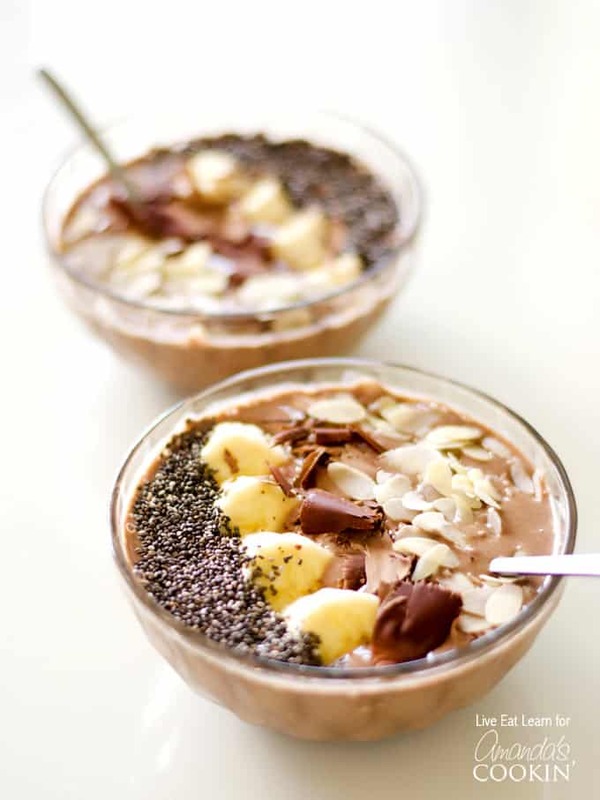 Mocha Smoothie Bowl: have a bowl of smoothie for breakfast! Smoothies and frappucinos have had their day, and now it’s time for a smoothie revolution. A revolution in the form of a little something called a smoothie bowl. This Morning Mocha Smoothie Bowl is a finger-lickin’ good breakfast that whips up in seconds but fills you up so much more than a smoothie ever could. 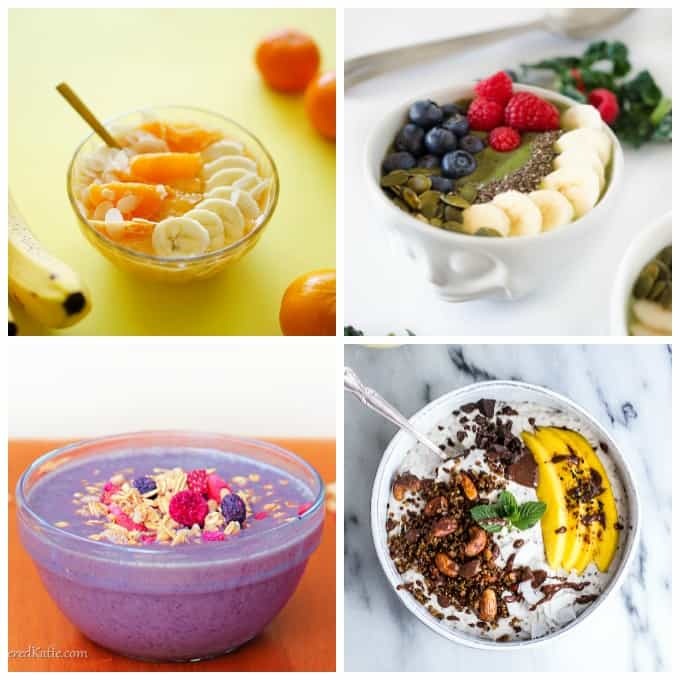 So what exactly is a smoothie bowl? Well it’s pretty simple really. You’ll make yourself a smoothie that’s a bit thicker than one you would drink, then pour it into a bowl. Now onto the fun part. Top it with whatever your heart desires! You can get really fancy with it or go for the minimalist approach. 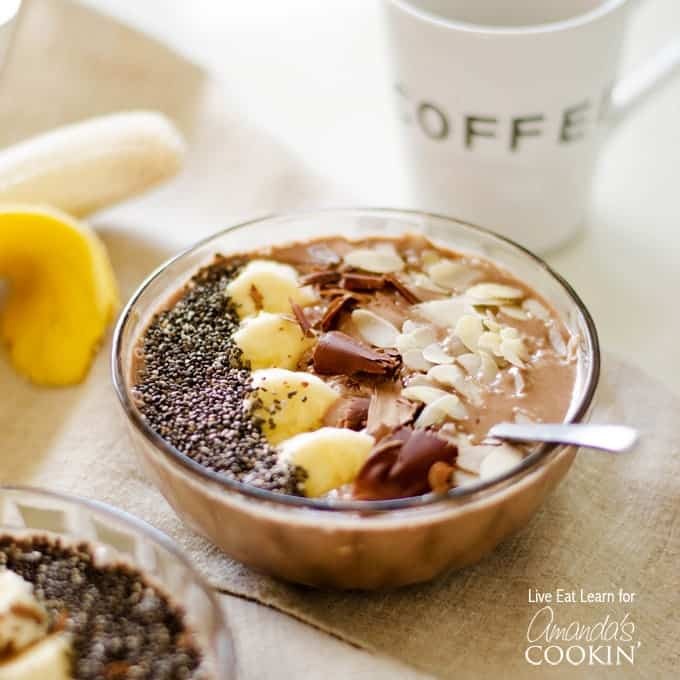 I’ve topped this mocha smoothie bowl with sliced bananas, chia seeds, sliced almonds, and shaved chocolate (Jamie Oliver has a great tutorial on how to shave chocolate here). 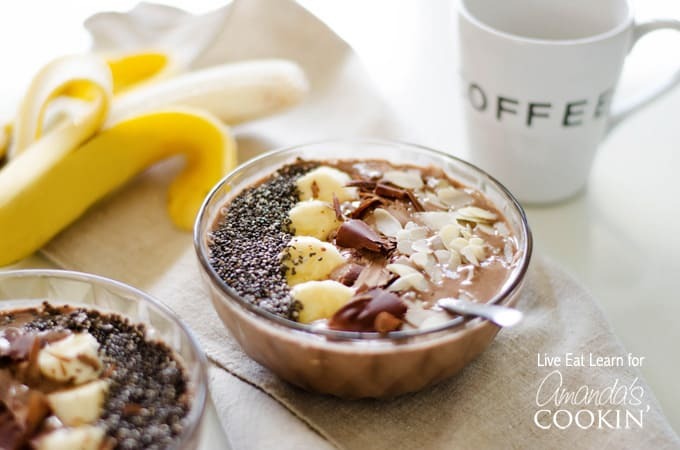 I’m guessing you’re a coffee fan since you are looking at this mocha smoothie bowl. So if that’s the case, you will want to check out this recipe for our Loaded Coffee Smoothie, perfect for on-the-go mornings! This recipe makes one big or two small mocha smoothie bowls, though I think you’ll find yourself wanting more, more, more! Any leftovers can easily be stored until the next morning, or mixed with a touch of milk and drank as a smoothie if you’re on the go. If you love fruit, this Almond Orange Smoothie Bowl is pretty amazing, just look at those beautiful colors! I found this Two-Toned Kale Smoothie Bowl over at the blog Live Eat Learn and it looks amazing. I am a big kale fan! The blog Chocolate Covered Katie has a recipe for this Acai Smoothie Bowl that I bet is fabulous! For tropic fans, this Coconut Banana Oats Smoothie Bowl from Half Baked Harvest would make a wonderful breakfast. This Mocha Smoothie Bowl is a finger-lickin’ good breakfast that whips up in seconds but fills you up so much more than a smoothie ever could. Blend banana, coffee, yogurt, cocoa, and sugar until smooth, adding ice as needed to reach a nice, thick consistency. 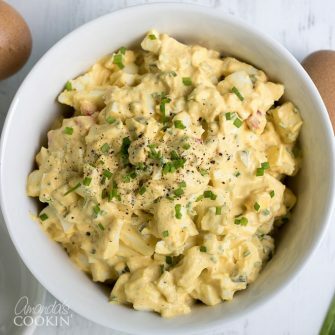 Top with whatever delicious additions you desire.